Last week we were in Wisconsin helping the in-laws get set up for their next estate sale. Among all the breweriana, old cars, and used tools where a large number of old photos and photo albums. Being one-legged wasn’t the only thing: to be a young — late teens or early twenties — and a woman, and missing a leg, would seem to be a unique combination. Was it an accident? Or was she born this way? As we pored through the albums, we saw several of her, alone and with family, and the question of how she lost her leg lingered. But, I thought: surely, a young woman losing a leg would be newsworthy, so I turned to the online newspaper archives I have subscriptions to. To our surprise, not only did I find the reason for her missing leg, but it turns out young Dorothy was a nationwide sensation, bestowed with 15 minutes of fame a decade earlier. That is 11-year-old Dorothy Hess in 1938: this picture ran in newspapers all across the United States. Dorothy’s leg was amputated the previous spring due to a bone infection. She took quickly to her crutches, but her loss attracted the sympathy of one of her neighbors. George Kiebler, president of Milwaukee district council of the U. A. W., lived just up the street from the Hess household. A plan soon came together. Newspapers report that “someone” close to Dorothy knew of “a man who procured an artificial leg as a premium for 46,000 cigar coupons.” For many years — and until very recently — collecting bands, cards, or labels from tobacco products could yet you prizes by picking an item from the tobacco company catalog and mailing the ‘currency’ in. But, an artificial leg? It’s a stretch, but, well, it was the 1930s, and with WWI battlefield injuries still relatively fresh in people’s memories, I suppose a wooden leg might be something you could redeem cigar bands for. Whether or not the 46,000 cigar coupon wooden leg redemption was true, Kiebler and the Hess family put the plan into action. Using his position in the UAW to Dorothy’s advantage, Kiebler asked union-members across the entire United States to cut the union labels from their packs of cigarettes and mail them to Dorothy, so that she would have enough by Christmas to procure an 11-year-old sized prosthetic leg of her very own. The caption says that, as of October 1938, Dorothy had 43,900 coupons — just 2,100 short of the goal, according to the apocryphal story of the tobacco-currency artificial leg that started the quest. However: whether 43,000, or 46,000, or 100,000 — the little pieces of paper in Dorothy’s hands would not be able to purchase an artificial leg, nor anything else. Much to the surprise of the UAW leader, collecting the union labels from the tobacco packages wasn’t the currency needed to purchase anything from a tobacco catalog. Upon finding out that they were collecting the wrong coupons, word went out quickly to begin collecting the correct tobacco labels to mail them as quickly as possible, in hopes of getting Dorothy a leg for Christmas. By mid-December, the new influx of the correct tobacco coupons had amassed over 20,000 of the little slips of paper, which were redeemed for cash from the tobacco company. Using the money, the UAW was able to buy Dorothy her first artificial leg, which was delivered December 19th, just in time for Christmas. 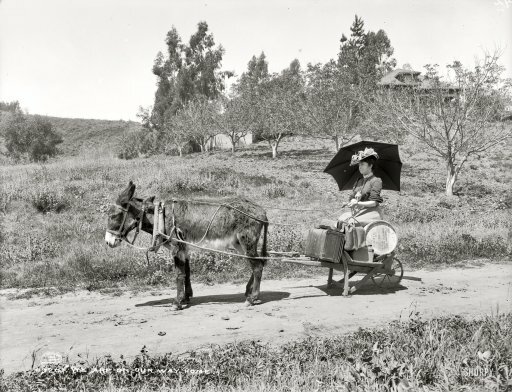 The photos of older Dorothy, however, don’t seem to indicate she was able to go without crutches very long. We hope that the 11-year-old-sized prosthetic leg gave her the opportunity to walk for at least a few years, but it would seem that as she grew out of the leg she didn’t replace it, returning to crutches by her late teen years. It just goes to show you never know what you might find at an estate sale — everything might have a story, even on that connects union workers and cigarette companies to a young girl’s wooden leg. The estate sale with Dorothy’s photos starts next Tuesday, November 1st. 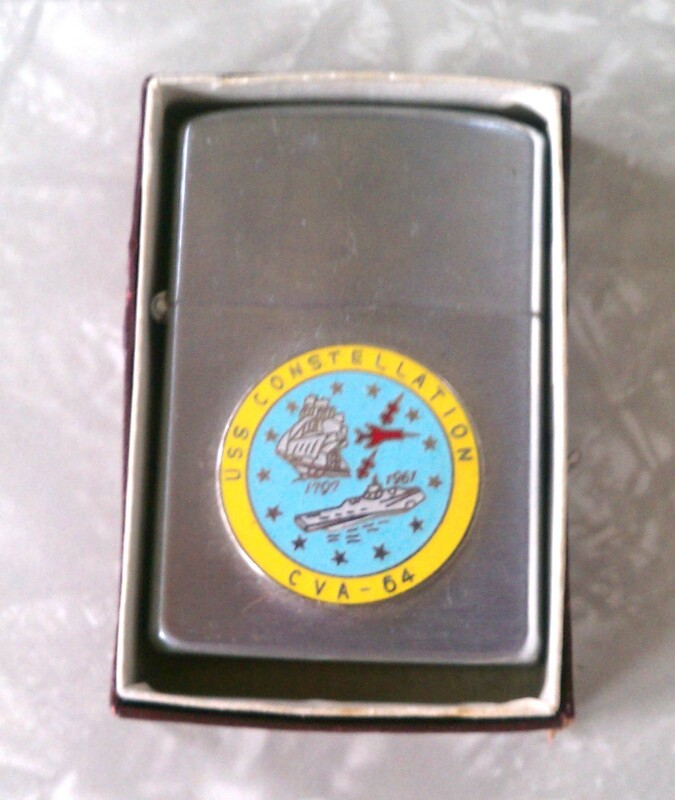 I’ve just listed this vintage lighter celebrating the U.S.S. Constellation CVA-64. The lighter bears the raised emblem adopted when the ship was first commissioned in 1961: a star-spangled blue field; the frigate of 1797 on the left; CVA-64, her aircraft and her guided missile battery, on the right; all encircled in yellow. 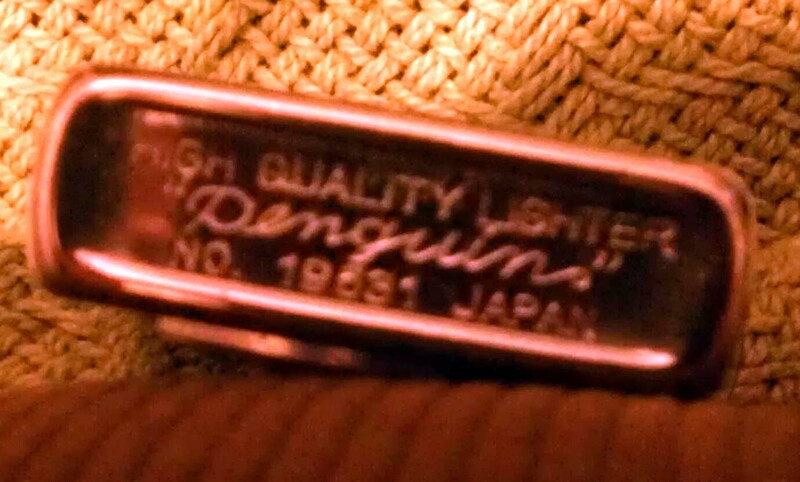 This full-sized brushed chrome lighter was made in Japan by Penguin (No. 19531). 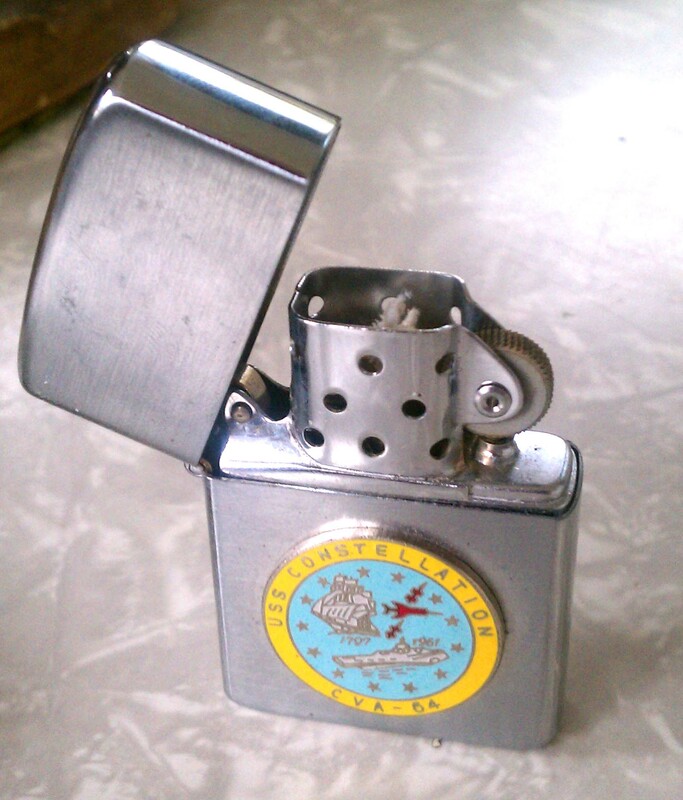 It is often compared to, or considered a knock-of of, the “original” Zippo “Town and Country” lighter. However, it is important for collectors of lighters to note that the Zippo version was not truly a Town & Country lighter. Zippo ended the Town and Country line in 1960; meanwhile, the USS Constellation (CVA-64) was launched October 1960, delivered to the Navy in October 1961, and commissioned at the end of October 1961. While the paint on paint process continued to be used by Zippo, lighters using that process were not part of the real own & Country line. It’s a great piece in terms of history; and in collecting, it’s a reminder of how wartime knock-offs are often nearly as valuable as the originals. If the knock-off was the lighter held back in the day, it’s the lighter you want today. 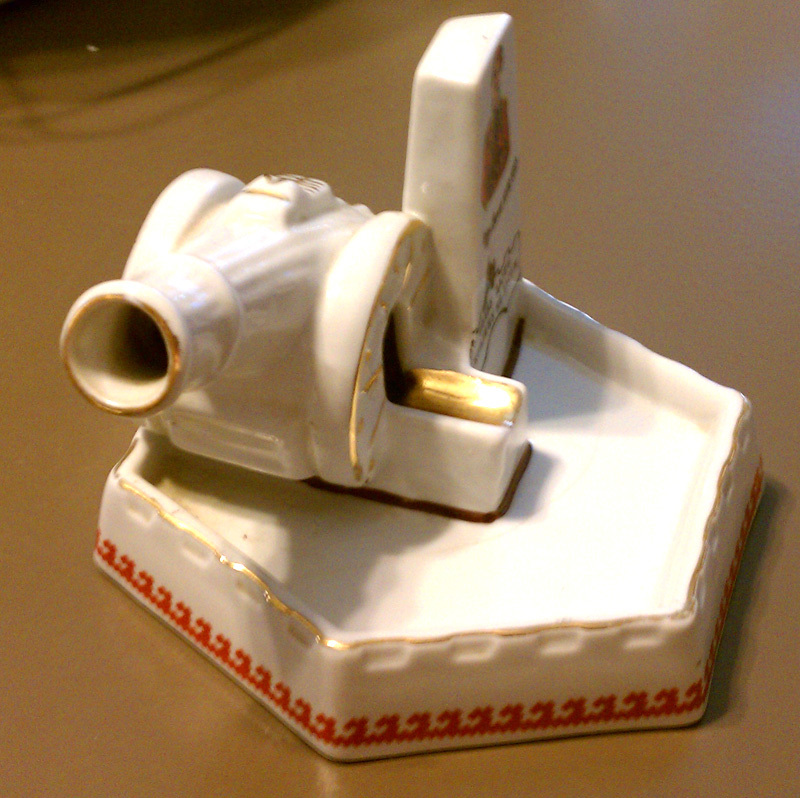 This vintage ceramic ashtray is kinda kitschy-cool; when you place the light cigarette in its place, the smoke comes out of the cannon! I just priced it and put in in the case at Fargo’s Antiques On Broadway. Derek sheds light on a ghost ad for the Harold Lloyd film Grandma’s Boy which was unearthed in Vancouver, BC, Canada. Our very own Pickin’ of Antiquips, aka Val Ubell, weighs in on the scale and shape of collectibles. I cover the record number of record collections and obsessively research the history of the Jay Herbert fashion labels. Cliff reviews The Story of Cigarette Cards (1987) by Martin Murray. 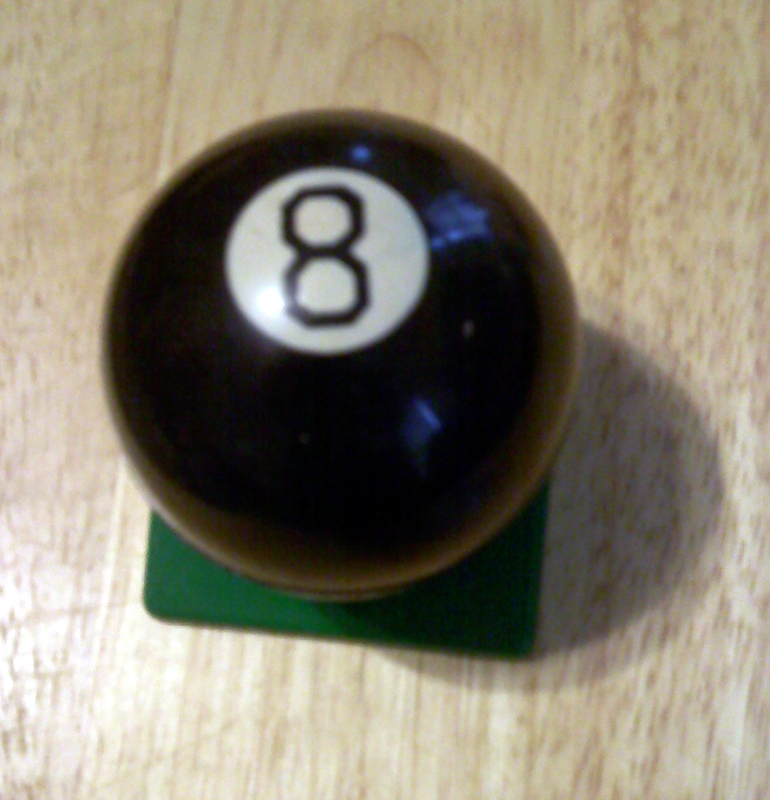 I’m a sucker for kitsch, so when I spotted this plastic 8-ball on a green stand, I had to pick it up. The top lifts off, showing a lighter inside it, making it a rockin’ display piece for the rec room or bar, even if you don’t have a pool table or don’t collect tobacciana; so I put it up for sale in my case at the Moorhead Antique Mall. 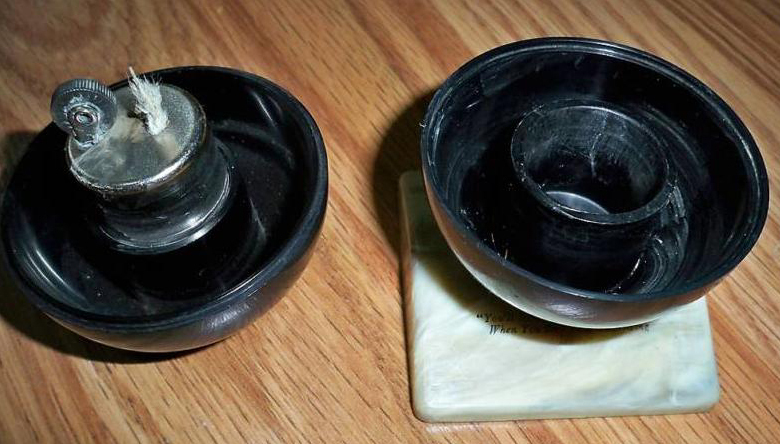 These vintage 8-ball lighters can be refilled; the flints and wicks likely are replaceable too. 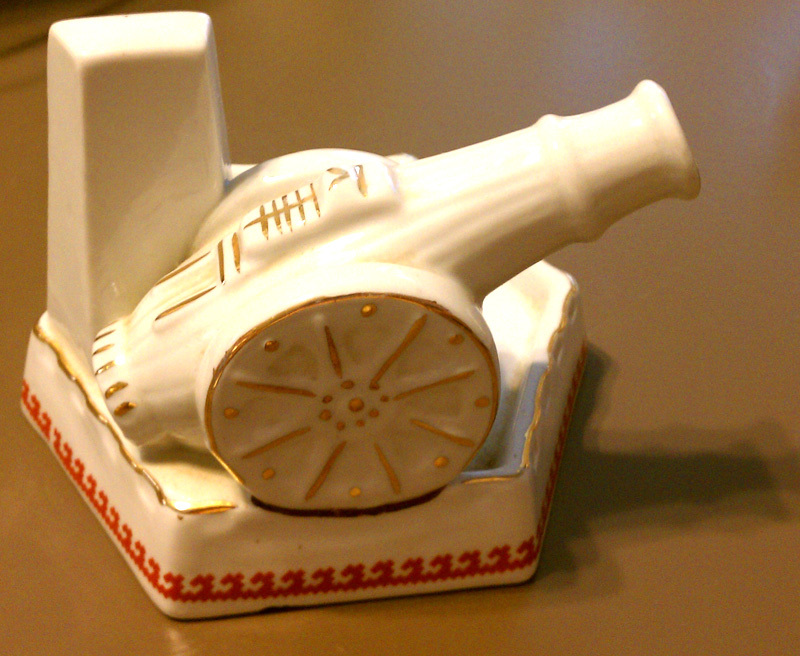 This this one has “Don’t Get Behind Me!” stamped onto the green base. Others are clearly more commercial, with promotional tag lines advertising companies and products. 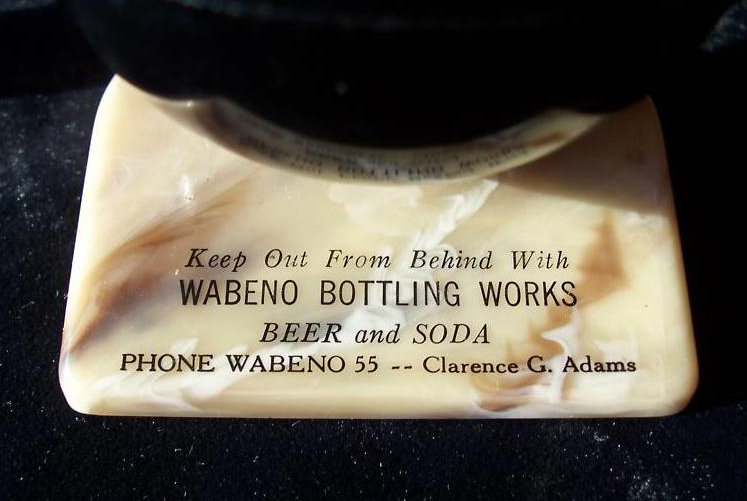 This one has a faux marble base with “Keep Out From Behind With Wabeno Bottling Works, Beer and Soda, Phone Wabeno 55 — Clarence G. Adams” printed on it. This one has printing on both sides of the base: “You’ll never be behind the 8-Ball when you buy your advertising” on one side, “1929 20th Business Anniversary 1949 Representing” on the other. None of these vintage 8-ball lighters seem to have maker marks or marks for where they were made; the rumor is they were made in Japan. But in any case, they are cool! Wabena Bottling Words (Wabena, Wisconsin) lighter photo via Whatnot Collectibles. 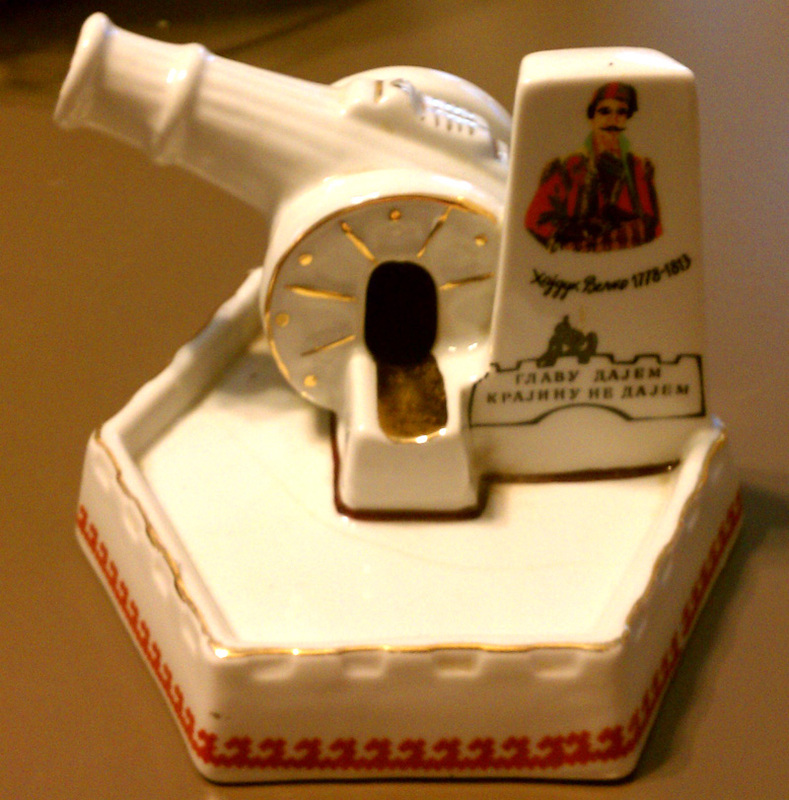 Vintage 8-ball lighter with printing on both sides of the base from Gathered Goods and Curiosities.